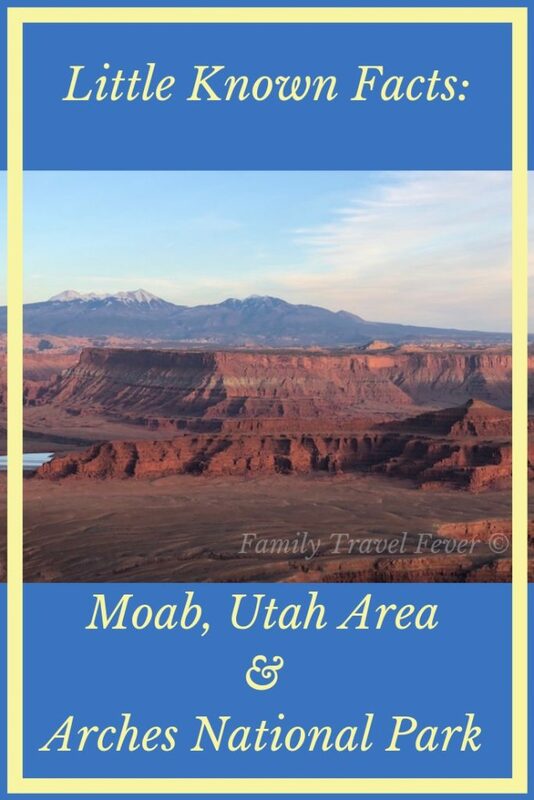 If you love travel trivia you will enjoy this list of fun facts- Moab, Utah area. 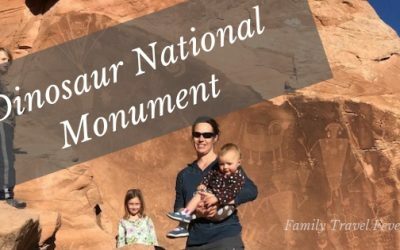 When we visited Moab, Dead Horse Point State Park, Canyonlands National Park, and Arches National Park, we learned so many interesting facts. The name Moab is a Biblical name for a place on the other side if the Jordan, just short of the Dead Sea. Quite possibly, 1880’s Morman settlers referred to the town as Moab for the physical similarity to the Biblical Moab. In fact, Moab is in 137 verses in the Bible. If you are interested Moab-Utah lists all the verses that Moab appears in the Bible. The name if the state of Utah comes from a name for the Utes, but it is not clear whether the name is from Spanish, Anglicized or Mormanized word or a Ute word. The Desert News wrote a myth-busting summary of the origins of the name. You can read more about the Ute people in this book written by Fred A Conetah, a Ute born in Fort Duchesne. Another account of the history of the area, is “Utes, The Mountain People” by Jan Pettit. The Paleo-Indians people lived in the canyonlands in the Moab area as early as 10,000 BC to 7,000 BC. By 1 AD, the people living the in the area were Ancestral Puebloans, known as the Anasazi and Fremont. After that, the Ute and Paiute people came to the area. Then the first European settlers started arriving in the late 1800s. Arches National Park had over 1.6 million visitors per year, Canyonlands National Park over 800,000 visitors, Dead Horse Point State Park is over 780,000 visitors. That’s more people than the whole city of Chicago! I was surprised to find out that over 50 movies have been shot in the Moab area including many Hollywood movies. On Discover Moab’s website, they list movies filmed in Arches National Park – like Indiana Jones and the Last Crusade, 1988 and Thelma and Louise-1990. 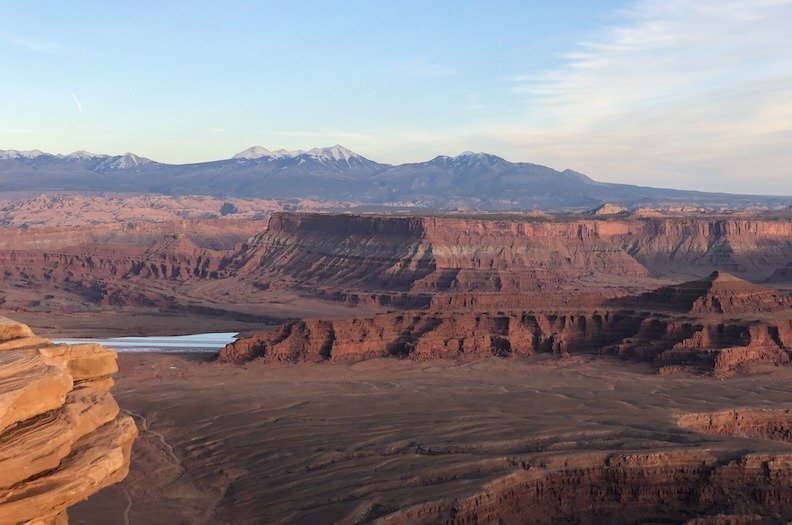 Surprisingly, I found, even more, were well-known movies were filmed at Dead Horse Point State Park- The Adventures of Joe Dirt, 1999, Mission Impossible II, 1999, Con-Air 1997, McGyver 1985, Warlock 1958. Movie buffs would enjoy a visit to the Moab Museum of Film and Western Heritage. The museum is self-guided and open to the public daily at no charge. Upheaval Dome is an unusual geologic formation in Canyonlands National Park. Mysteriously, rocks that had been buried a mile underground are on the surface of the crater. Geologists think it may be either, the crater was formed by a meteorite or a salt dome that had collapsed. 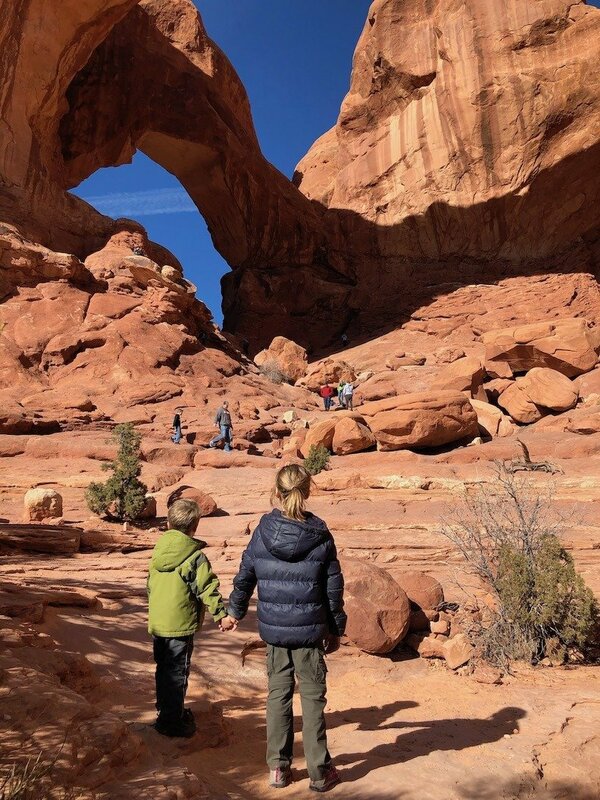 The highest density of natural stone arches in the world (over 2,000) can be found in Arches National Park. Delicate Arch in Arches National Park is the most famous and most photographed arch in the world. These natural stone arches have a lifecycle, which includes forming, growing and then finally collapsing. In fact, forty-three arches are known to have collapsed since 1977. Balanced Rock is 128 feet tall and weighs an estimated 3600 tons. A smaller pillar right next to it, named “Chip Off The Old Block,” fell in the winter of 1975-76. In the 1950s geologists found deposits of uranium ore near Moab. The discovery was timely because the US was in the midst of the Cold War and nuclear power was becoming more common. Moab experienced a boom and became known as the Uranium Capital of the World in the ’50s. Later mining activities turned to Potash and Oil and Gas. The Potash evaporation ponds are bright blue in the viewpoint from Dead Horse Point State Park. The Moab area had some of the darkest night skies in the US. Astronomy fans will be impressed to see the Dark Horse Section of the Milky Way with the naked eye. A year later, Dead Horse Point State Park is recognized as an International Dark Sky Park in 2016. They have a fun full moon ranger talk at the visitor center on the Saturdays of the full moon. The kids and adults in our group enjoyed learning about the moon stories of the night skies. 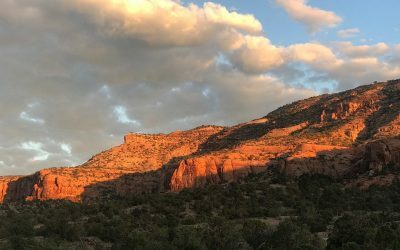 The National Parks in Utah adds about $1.1 billion dollars to the state’s economy. Most of the money is spent on hotels (35%), restaurants (%20) and gas (%11). In fact, the National Park System (NPS) estimates that visitors to Arches National Park spent $189 million in communities near the park. 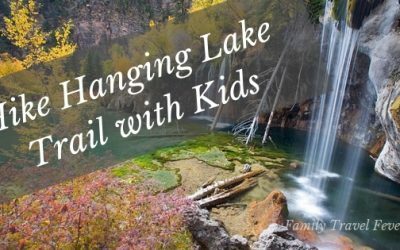 I hope you learned a new trivia question about Arches National Park or Deadhorse Point State Park? 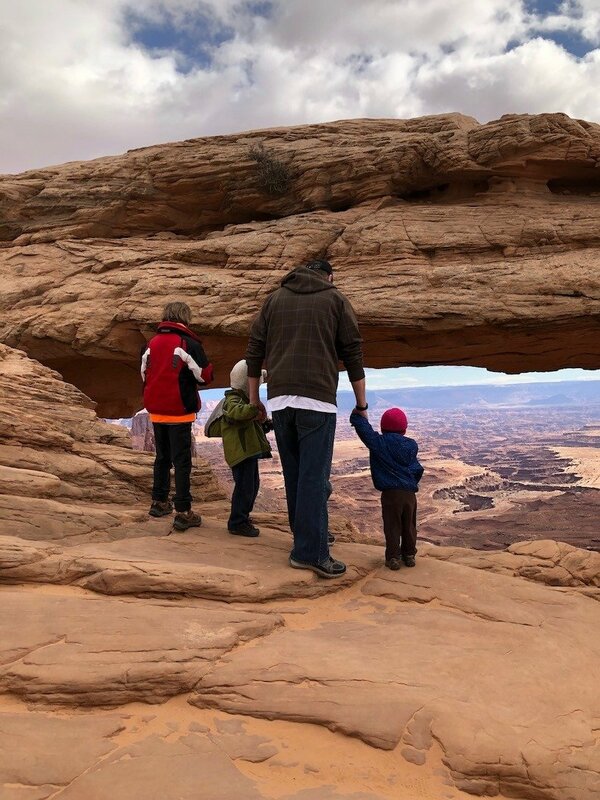 What’s your favorite fun fact about the Moab area? Tell us in the comments.